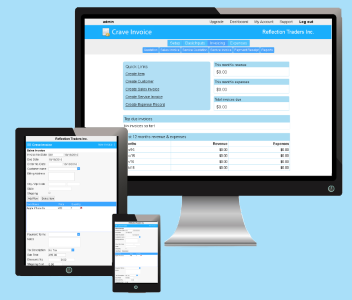 Prepare and send invoices to clients for your services as well as product sales. Record expense journals for all business expenses including travelling, food, office stationery etc. Generate and send purchase orders to your suppliers and keep track of pending orders. Monitor item inventory with useful inventory reports as you purchase and sale items. Generate supplier payment journals for all due purchase invoices. Use CraveInvoice software offline by installing it on your desktop computer or laptop. Use CraveInvoice online from secured servers anywhere with a browser and Internet access. Use CraveInvoice mobile web app by logging in from your mobile device while on the go.